Sometimes in fashion we hit a rut. We see the same designs from every brand. Nothing seems fresh, nothing seems revolutionary. Until now. Let me introduce you to W Concept, a brand built upon bringing together new, independent designers and artists with fresh collaborations each season. Street chic but also classic in design, this statement jacket from W Concept is brilliant in so many ways. Born from a collaboration between Front Row and InstantFunk, this unisex jacket takes a classic bomber and recreates it into an avant-garde piece. Not only is this water repellent jacket reversible to a naked lambskin leather bomber, it also comes with a detachable thin, goose-down, hooded jacket. 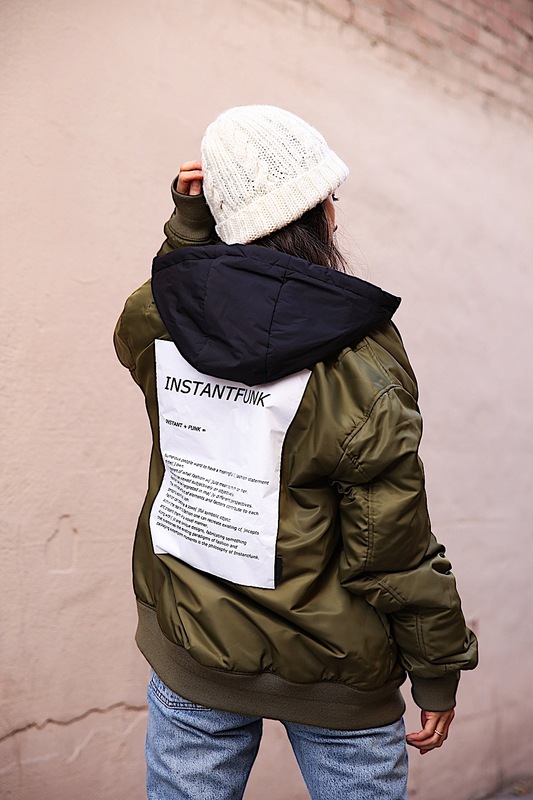 Talk about a major layering moment, but also three jackets built into one! I paired this streetstyle jacket with denim (of course) and these beautiful patent, pointed toe booties by Meno de Mosso. I love the contrast of the olive bomber jacket with the wine boots which are both perfect colors for fall. These pointy boots are comfortable and true to size (check out the size conversion chart when purchasing) and the low heel makes it comfortable to wear all around town. I’ve worn these boots a little too much since getting them with jeans as I did here, but also with dresses and skirts. I also picked up this cable stitch cardigan (sold out in grey) because who can resist cardigans for the fall season? Cardigans are also great layering pieces that can be taken into winter. This particular cardigan from Nilby P is functional two ways – worn with the buttons and v-neck in the front, or turn it around and have the buttons going down your back. The fit of this cardigan is a bit oversized and slouchy which is completely on trend, so I styled it slightly off the shoulder with the buttons facing the front. Based on my selections from W Concept, I can already tell I will be shopping here more often. Their collaborations with emerging designers are refreshing and the thought behind each piece and its functionality and versatility speaks volume. You know when you purchase a piece here you’re obtaining something unique that not everyone else will have and it will also be a piece that can be worn a myriad of ways. Check out W Concept and let me know your thoughts! Thank you to W Concept for sponsoring this post and introducing me to these up and coming designers. I can’t wait to see what you have in store with every collaboration you do! I’ve never heard of W concept but I can agree that it’s refreshing to see new designers and clothing. I love the oversized bomber because it’s very street styled appropriate. The cardigan is also a staple since it goes with basically everything. I am excited to see what else they come up with as well! That outfit is so cute! I love the color of that jacket. Love the booties and great contrast between them and sweater. Ok, hello new favorite bomber of mine! I mean seriously, that is SO me! I love the fun patch on the back (and actually have something similar, but a denim jacket) and your styling is amazing. I also love the knit, but my eyes are all on this bomber right now!! Thanks for introducing me to this brand! Girl, I am obsessed with W Concept, they have the coolest stuff! I adore your olive jacket, it’s so street chic! I’m loving that bomber so much! <3 🙂 It's sooo chic and I love the sporty, street style vibes! Perfect for layering in the fall! Love your sweater & jeans, pretty girl. I love unique jackets like this that are subtle, chic but also make a statement where you least expect it. As always, you styled this outfit so well and so effortlessly, and I enjoyed this post a lot 🙂 Have a great rest of your weekend! Umm…is there anything that doesn’t look amazing on you?! I am digging the street style vibes on you. That khaki bomber and those boots are calling my name! I will definitely be checking out W Concept! 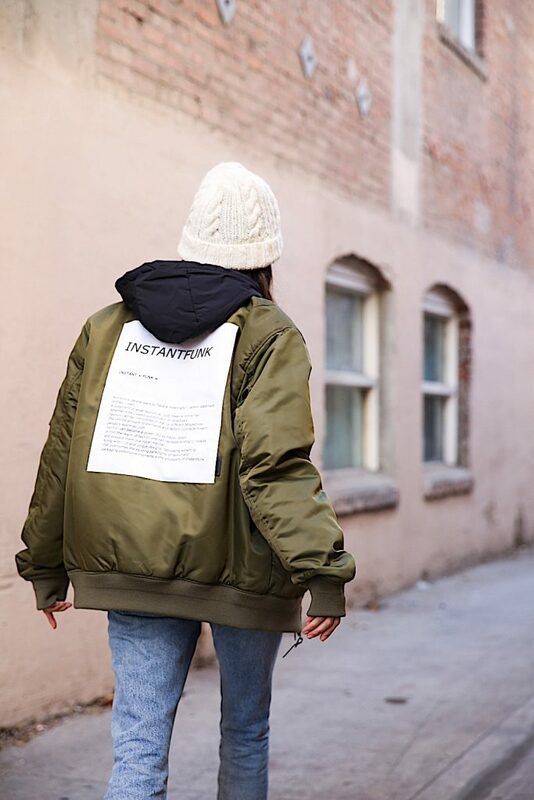 Love your Instantfunk W Concept bomber jacket and the army green color. And I love your over sized sweater. Great look. That jacket looks so good on you! Kinda iffy with the back of the jacket, but hey, you make it work! It looks like those pieces were made for you, because you look stunning in both looks. The firts one is my favorite, what a fabulous bomber, its color is perfect for the season. You look chic and edgy at the same time and I loved the shoewear you chose to complement your entire combo. 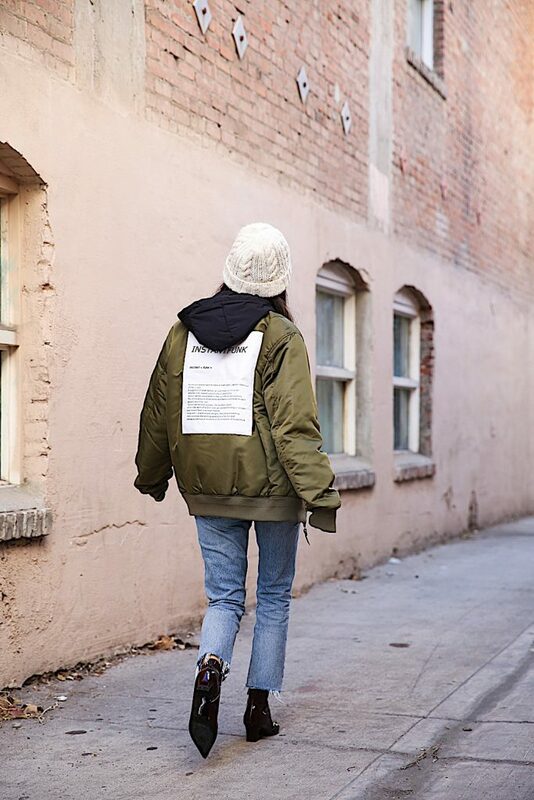 I love discovering new designers – this bomber would make such a great addition to any closet. I love that it’s reversible – you get more bang for your buck that way. Loving how you styled it with those cute booties – so fresh! Your street style is on point! I am loving all the asymmetrical details! That grey sweater is everything. And yes I agree with you. I feel like I’m just seeing the same thing over and over just a different brands slight take on it. I like that this is so different from what you normally see. And that bomber is stunner! Looks like such a cool brand! You are so right when it comes to seeing the same designs over and over again. It’s nice to see something new. That bomber is legit! Amazing post, thanks for sharing! W Concept sounds so cool and I love these looks! Thats soo true, sometime fashions gets really repetitive but this collection look so much different and edgy! Great style! Such an edgy look dear! I love the jacket paired with fab and shiny booties. Super edgy and fresh, Christine!! I LOVE you with bangs. Really inspired seeing these two unique looks on you… ruts are real, especially when it comes to style. I’m feeling like it’s time to switch up the look! I am totally loving this bomber on you babe!!! Thanks for sharing this brand, I’ve never heard of them!! I love both looks on you! The first one is so fresh. I’d never seen you in a hat and bomber like that and you pull the entire look off amazingly! Selecting emerging designers is so wonderful. I hadn’t done that as much as when I lived in Canada, and it’s such a great way to find killer pieces that not as many people have. The sweater in your second outfit looks so cozy. I’d love to add another knitted cardigan in my closet. This is so efforless chic! You look gorgeous babe. I hope you have a wonderful week! Love your street style girl, and who wouldn’t love a casual chic outfit. This jacket is so versatile that I think we all need it, and that cable knit cardigan is also super cute. Never heard about W concept but it does looks very interesting. I always love to get things that one has and specially from new emerging designers. I really love this grey cardigan such a nice one for this fall season and a great piece to travel. SO. MUCH. YESSSSS! First off, I really love your new hairstyle. Secondly, I am obsessed with both of these outfits! I saw them on Instagram and NEED the sweater and bomber jacket! I have never shopped on W Concept, but going to go through the website now! Loving all of their streetstyle pieces. You look amazing and fab, Christine. You look gorgs in jeans! You definitely nailed this look. Argh! You have described the exact pet hate I have with fashion. In Australia every store always has virtually the same clothing, and I’m exactly like you – I appreciate something different and a unique spin on something that already exists, instead of just creating a carbon copy of it. Definitely going to be checking out W Concept. Thanks for the inspiration and the great look – you look fab! You look amazing in both looks but my absolute favorite was the first one. 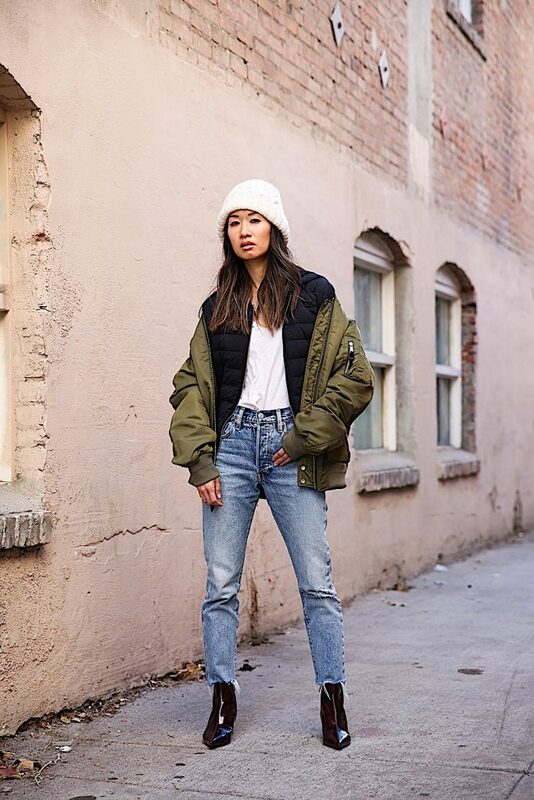 I love how you styled that bomber jacker, babe! Wow! I love how street style these looks are. The bomber jacket looks absolutely stunning on you, and I love the denim that you paired it with. Plus, the beanie that you are wearing is SO cute. I could definitely see myself wearing this. W Concept sounds right up my alley I love checking up coming designers and something edgy and more substantial than the usual repeated cycles of fashion. 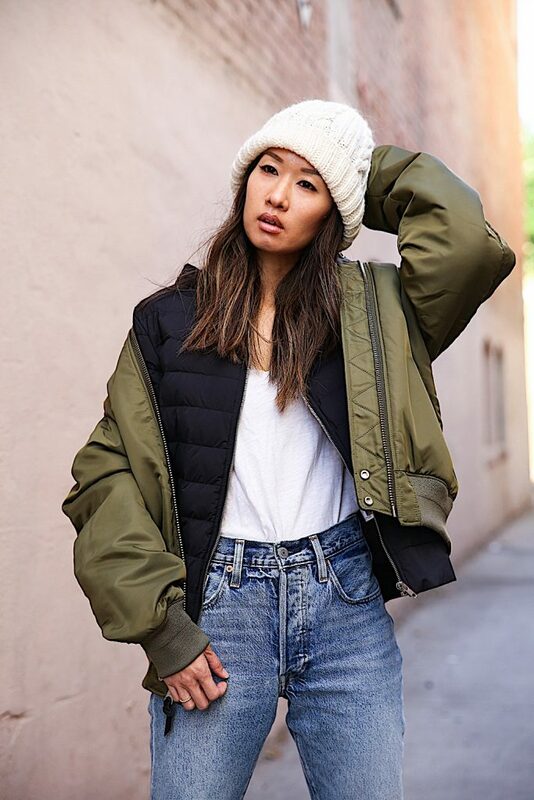 I love the color olive green and bombers are such a casual stylish piece that is rather versatile and with Goosedown girl you’ll be keeping warm this winter. A knit is a essential for the cooler months and in grey that cardigan looks super soft and very stylish. You always look effortlessly stylish and I love that you don’t follow trends and just wear what you love,keep rocking it girl! I remember seeing you style both of these looks on your Instagram feed and was instantly obsessed seeing you style them! That bomber especially caught my eye because it is so incredibly versatile, not to mention practical! Plus that olive color color goes with absolutely everything- what’s not to love?? And you’re so right on styling it with those sleek wine colored boots, the perfect complementary pairing. And I love how you shared another piece from W Concept too- that slouchy sweater is so on trend! I never feel comfortable styling similar oversized knitwear, but after seeing how you did it, I might have to give it another go 🙂 These looks have got me completely sold on this brand. Do you think they’ll have any Black Friday deals?? I’ll definitely keep an eye out for their pieces while shopping in this next month 🙂 Thanks so much for sharing such chic and killer looks!! Love these looks! That chunky cardigan.. LOVE! I love the jacket. So amazing. I also love the sweater. Great outfits. Girll.. you look so badass in this outfit and it’s kinda a different look than what you normally go for and I love it! I’m always looking for ways to “freshen” up my style too cause I get bored easily wearing the same rotation of clothes and styles. Love how you experiment with your taste in clothes. Be bold! That jacket is to die for. I could imagine feeling really cool and hip while wearing it. It’s amazing how this brand brings together the talents of up and coming designers. They surely give us a fresh take on fashion. Absolutely love the first look!! Special de jumper!!! I am loveloveLOVING bangs on you lady! Definitely softens up the edgier looks I’ve been seeing you gravitate towards. Way chic as always! AMazing W Concept jacket . Love how you layered up . The warm cardigans are my winter essentials when here in Italy become the cold . I love that the W Concept is a hub for shopping emerging designers. The jacket is phenomenal! I adore that it’s not only multi-functional but that it’s unisex! Definitely a perfect must have piece for the up coming season. I was incredibly blown away by the stunning color and patient leather of your boots! They are top notch and another seasonal must have! The rich plum color has me styling so many different options with it in my head! Love how you styled this cardigan! You always style in such a alluring yet classy way! It seems like the perfect texture and the cut it spot on too! Love that you paired both of these looks with a classic pair of gorgeous denim! Both of these looks are totally gorgeous! This jacket looks so snug and warm for the cooler months and I adore how it has different layers. Fantastic that it’s reversible too- that really is value for money! The patent wine-hued boots look so chic with both looks and I adore the pointy toe style. The cardigan looks so cool buttoned up and slouched off the shoulders too- it just looks so effortless. This is the coolest ever, you just nailed it! As always, I love the way you style fashion so natural yet very alluring. I’m always a fan of your styling. The denim and sweater look is my fav but still loving the street style in the first look… especially the bomber jacket. It helps when you are so gorgeous too. Oh wow never heard about that brand before nut love their approach!! Great pic by the way – you’re such a babe!! I love the ensemble here for sure. So chic and statement pieces. Great styling! This brand got some swag. Never heard about W Concept before but its LIT. I am definitely getting hooked on this brand. I love the whole double jacket thing! That is so cool!! The colours work so well together, I always love your denims! !